Federico Caprilli’s Forward System had an impact on jumping worldwide. (check out my article “Backwards and Forwards: The Evolution of Jumping“) His methods were adapted in different ways to suit the riding needs in various countries. Caprilli’s student, Piero Santini, indicated that the Cavalry School at Fort Riley had made the fewest changes and was closest to the Italian system. (In reality the system used at Fort Riley was a combination of the Italian and French methods. ) Caprilli believed that the horse should be allowed to travel and jump as naturally as possible and that it was the rider’s responsibility to impede the horse as little as possible. Today we see riders sitting behind the motion, driving the horse toward the fence with an aggressive seat, as if they could cause a reluctant horse to become brilliant. We see riders in various contortions over the fence. And we see every sort of bit and device used because riders go from much contact to no contact and back to contact, during their ride over a course, losing steady communication with the horse. Where has Caprilli gone? It was refreshing to read “Master the Principles of Jumping” by Sandra Oliynk in the April ’10 issue of Practical Horseman magazine, that George Morris is teaching some of Caprilli’s principles. The article is written from the 2010 Horsemanship Training Session. It starts with cavaletti work. 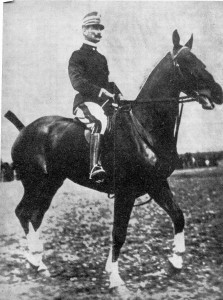 Caprilli advocated for the horse and for less force from the rider. He was a natural horsemanship advocate. He believed that left to its natural state the horse was relaxed and capable of making decisions about jumping and that it was the rider’s job to interfere with the horse as little as possible. He believed that trouble began when the rider introduced school movements, deep seats, and collection. Caprilli believed that the rider caused the tension which resulted in pain for the horse and that these things caused fear and opposition. Would you like to receive interesting articles from U.S. Horsemanship right in your inbox? You can sign up for U.S. Horsemanship News by putting your name and email address in the subscription box at the top right of this page. When you sign up I’ll send you a link for a free pfd of the 1912 French Cavalry Manual that was used by the Cavalry at Fort Riley. And I promise not to share your email address.